If anyone’s going to do it, Burton feels like a solid pick. How did they manage to make a flying elephant boring? A pale imitation of the original. Tim Burton’s overstuffed and underwhelming sideshow act lacks a sense of wonder. Tim Burton changed the Disney game in 2010 when his live-action adaptation of Alice in Wonderland took over $1 billion at the global box office. Ever since then, Disney has been organising remakes of just about every title in their hallowed vault with military precision, pivoting from original stories to those with a built-in audience of adults and children who are already familiar with the plots, characters and songs. At the time of writing, seven of these titles have been released, with two more due before the end of the year and a further eight in production. In short: Burton has an awful lot to answer for. On paper, tapping the creator of Big Fish and Edward Scissorhands to bring the surreal story of an outcast elephant with a special gift to life feels like a no-brainer. When Burton is at his best, his knack for visual spectacle and whimsy is a genuine delight. When he’s at his worst… we end up with Dark Shadows. But this nouveau Dumbo should work: it boasts a director with a flair for the theatric; an all-star cast including three Burton alumni in Danny DeVito, Eva Green and Michael Keaton; even an obligatory Danny Elfman score. It’s quite impressive, then, that the end product is such a gigantic disappointment. The original 1941 Dumbo – running at 64 minutes – is beautiful in its simplicity, and despite the titular character being silent, he’s very much the heart of the film. 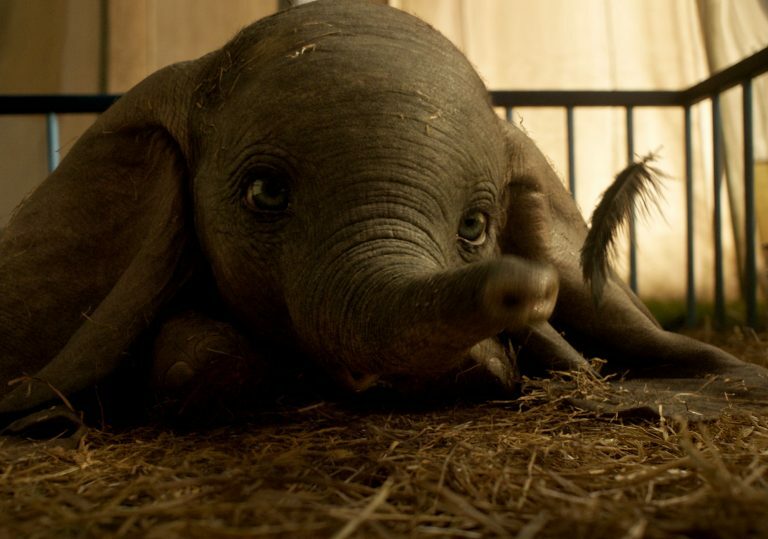 In Burton’s swollen 112-minute version, Dumbo is relegated to a supporting character in his own origin story, as room is made for a whole new cast of wacky characters. Chief among them is Colin Farrell’s Sad Dad Holt Farrier, who returns from the battlefields of World War One to the travelling circus he calls home. He’s now minus an arm and minus a wife, who died while he was away, but his two children, Milly and Joe (Nico Parker and Finley Hobbins) are happy to have their pop back. Meanwhile, zany master of ceremonies Max Medici (DeVito) has acquired a pregnant Asian elephant named Mrs Jumbo, whose baby he intends to make the star of his show. What follows is a long, long story that briefly touches on aviating elephants, the tyranny of capitalism, and uh, little girls who want to be scientists. 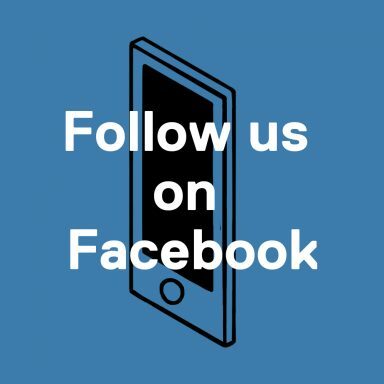 Much like the sensory overload you might experience at a carnival, there are so many things going on it’s hard to know where to really start – especially since the only thing one really wants to watch is the sweet baby elephant. 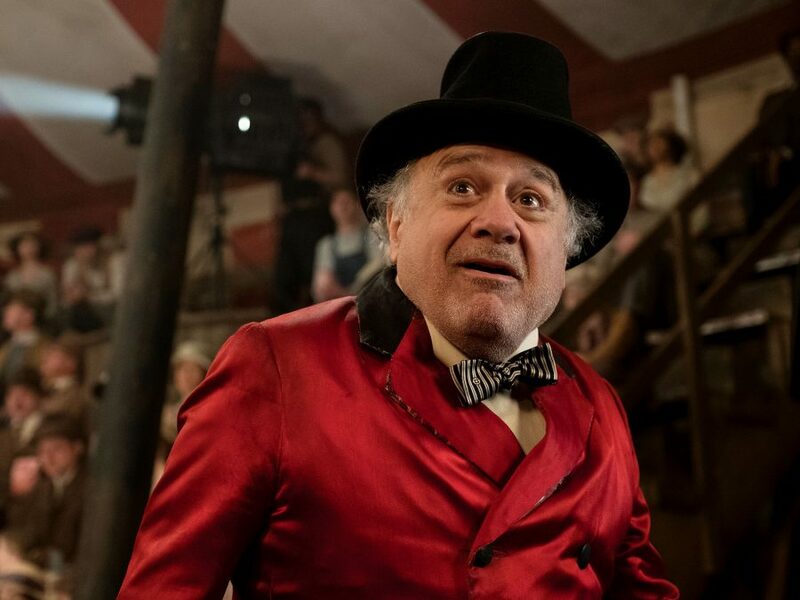 The only cast member who appears to be enjoying himself is DeVito, gamely donning the ringmaster getup once more having first done so for Burton in Batman Returns and then Big Fish. Michael Keaton’s villainous venture capitalist, VA Vandevere, is perhaps the greatest disappointment, as he looks totally bored – but it’s hardly Keaton’s fault, given how little there is for him to play with. Eva Green is similarly wasted in the thankless supporting role of ‘French Trapeze Lady’ Colette Marchant. Even the CGI elephant looks like he’s phoning it in. While Burton’s film retains the ‘Baby Mine’ scene which has made countless children and parents weep for 70 years, the rest of the musical numbers are nixed, only briefly alluded to (a stork near the film’s opening, a half-hearted Pink Elephants reference). And where Jon Favreau created a lush, immersive world in 2016’s The Jungle Book while retaining the spirit of the original, Burton’s film lacks a strong visual identity, as well as that most essential Burton/Disney element: a great villain. There’s no sense of wonder, no sprinkling of magic dust. There was a time, of course, when Disney made original films, rather than simply churning out sequels and ‘live-action’ reboots of the stories they own the intellectual property rights to. Lavish musical numbers, bold and colourful worlds, snappy kid-friendly runtimes, and a strong message at the end of it all: there was a formula, but the formula worked. It’s now 10 years since Disney’s last hand-drawn animated feature, The Princess and the Frog, which was considered a box-office disappointment and ushered in the age of Frozen and the current spate of hit-and-miss updates. Given the number of these films currently in development, it’s clear that Disney is firmly wedded to this new model, but Dumbo is proof that even when you have an idea that feels like it should work, it’s all about the execution.